I want to get an early start tomorrow morning taking bus 83O from Taksim Square to the Bayrampaşa Otogar bus station to the west. 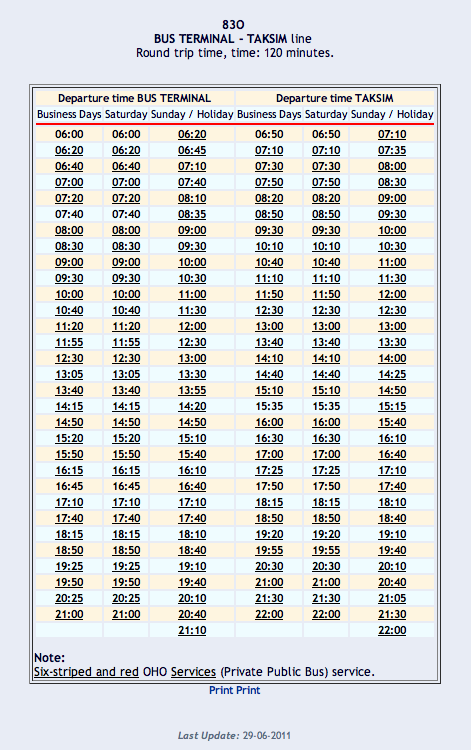 I can't find by searching in English what time the Istanbul public buses commence operation in the morning. If they start at various times it's this particular bus I'm interested in. Web site of Istanbul city buses is IETT (in turkish). To the left, there is a form labelled "Hat Arama". Typing 83O in this form, then clicking on "Saat" button below gives timetable for this line. Copy/paste the (long) URL to Google translation gives first departure from Taksim at 6:50 AM. When you buy your bus ticket in Turkey, always check if they provide transport to the bus station! The larger companies have networks of minibuses which ferry passengers from their ticket offices to either the bus station or staging points which will meet the bus on its way out of town. Unless you are travelling on an obscure company, you usually don't need to take the city bus or metro to the Bayrampaşa Otogar. Not the answer you're looking for? Browse other questions tagged planning turkey istanbul buses or ask your own question.